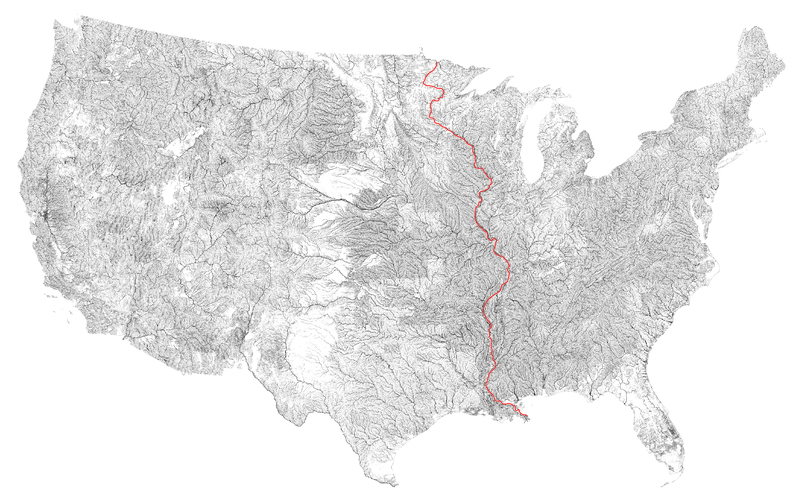 Since 9000 B.C., people have traveled upon the largest watershed of the North American continent: The Mississippi River. With fully loaded bikes, we will ride for 2,320 miles through its watery heartlands. Fervent curiosity about our domestic heritage fuels us. Foremost, we seek frank conversations about local identity and human connection by river. As we encounter sites and culture along the river’s banks, we anticipate ample opportunities for independent research and creative investigations in architecture and sustainability. The backbone of our domestic landscape holds an inexhaustible collection of narratives. Loosely following the Mississippi River Trail, we begin in International Falls, Canada, around 100 miles north of the Mississippi Headwaters in Itasca, MN. Our finish line is a bit south of New Orleans, in the Gulf of Mexico, where the river meets the sea. This is so dope. I hope it’s started out well for you guys! Big beautiful wishes to your time on the road!